This report will be updated once more in another day or two with the final details. Two skiers went for a late afternoon ski tour near Electric Lake. They made at least one run down a low angle northeast facing slope. They ascended a ridgeline and for their last run chose a steeper northeast facing slope. The first skier successfully skied to the bottom and waited for his partner out of sight of the slope. When his partner did not show up, he climbed back up a short distance and found an avalanche. He did a quick search on the surface of the avalanche debris but did not find his partner or any clues. They were not wearing avalanche transceivers, and he called for help. Emery and Sanpete County search and rescue arrived at the scene around 8pm. Inability to assess avalanche danger on adjacent slopes, mainly due to darkness, did not allow the rescue teams to get onto the debris. A helicopter searched from the air with spot lights. At midnight the decision was made to regroup Saturday morning and continue the search. On Saturday, January 19 the search resumed under the command of Emery County Sheriff's Office. Explosives were used to make the scene safe and ensure more avalanches would not occur. People were staged near the avalanche debris in anticipation of performing a probe line. Searchers on skis started at the top of the debris field using a RECCO device and an avalanche search dog. The search dog located the approximate location of the victim which was confirmed with and avalanche probe at approximately noon on January 19. The victim was buried a maximum of a meter deep and was found in a prone position facing downhill. More information and photos has been posted by the Emery County Sheriff's Office HERE. While the vertical drop was about 600 feet, the slope distance this avalanche ran was 1,500 feet. The Electric Lake bowls sit just south of state highway 264 and just west of Electric Lake proper. The bowls are easily reached from the parking lot and are some of the more accessible terrain for skiers on the Skyline. The accident took place on a steep northeast facing slope at 9500'. Aspect ranges from due east to northeast. There were many undulations in the bed surface. Many of these were caused by large rocks. It was notable while walking on the bed surface how "rolly" it was with many partially covered rocks. These can often serve as good trigger points where the snowpack is a bit shallower. A few of these rocks can been seen in the second photo below. We measure snowfall in terms of the snow water equivalent (SWE). In other words, its how much water the snow contains. If you melted the snow, how many of inches of water would it be. From an avalanche perspective, we don't care how much snow fell. We care how much weight was added to the snowpack. More weight = more stress. The more you stress something, the more likely it will break. When the snowpack is stressed and breaks, it produces avalanches. A rough guide is that 1 inch of SWE is about 10-12 inches of snow. 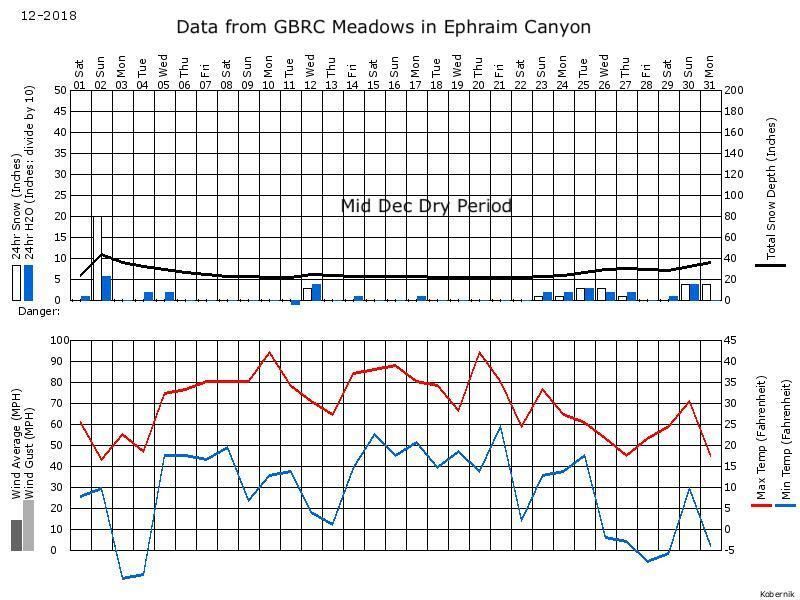 Some snow fell in October which remained on upper elevation north facing slopes but the the snowpack started forming in most places around November 21 through December 3 when snow containing 6.7 inches of water accumulated and formed the base of the snowpack. Some snow fell between December 3 and December 22 with more significant storms around Christmas and New Years. More importantly during this time, there was a notable dry period. This clear, cold weather created weak, faceted snow (aka - sugar snow) near the surface. The weak layer which this avalanche fractured into was formed between Dec 13 and Dec 22. Significant snowfall returned on January 6 when a 2 day storm delivered 15 inches of snow containing 1.6 inches of water. The next period of snow occurred from January 15 and ended just a few hours before this accident occurred. Snow from this storm was 12 inches containing 1.4 inches of water. 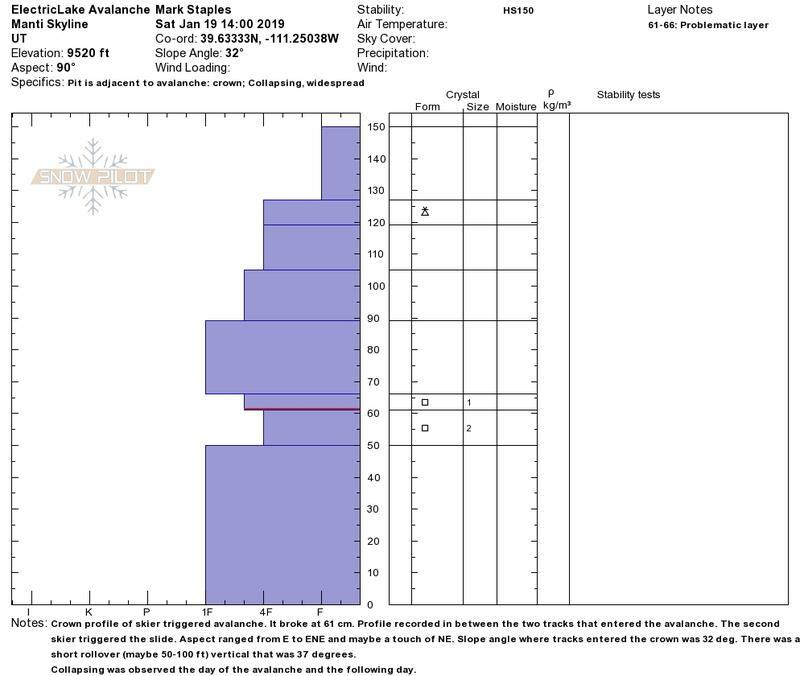 These were manual snow measurements from a snow study plot very near the Electric Lake dam which is 3 miles SSE of the accident. 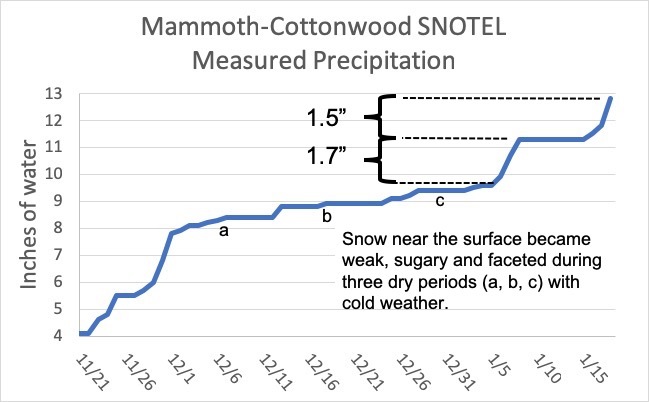 Data from Mammoth Cottonwood Snotel (5 miles NE of accident) is also provided in a chart below. Snow from these two storms was clearly evident in the crown face of this avalanche. In photos below you can see two distinct layers that made up the slab. Trees surrounding this accident site were still covered with snow at the time of the accident indicating minimal wind. However, this slope may have been loaded by strong southwest winds that wrapped around this slope and cross loaded it during a period of very strong winds late on the night of Jan 17. 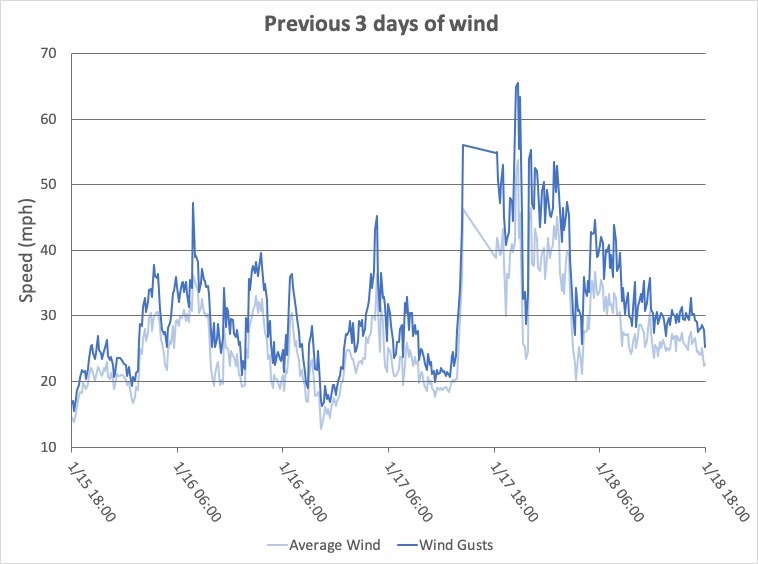 At that time winds averaged 40-50 mph with gusts of 50-60 mph. Much of the avalanche activity occurring in this area prior to January 15 happened on wind loaded slopes. An avalanche in Rolfson Canyon was a good example. 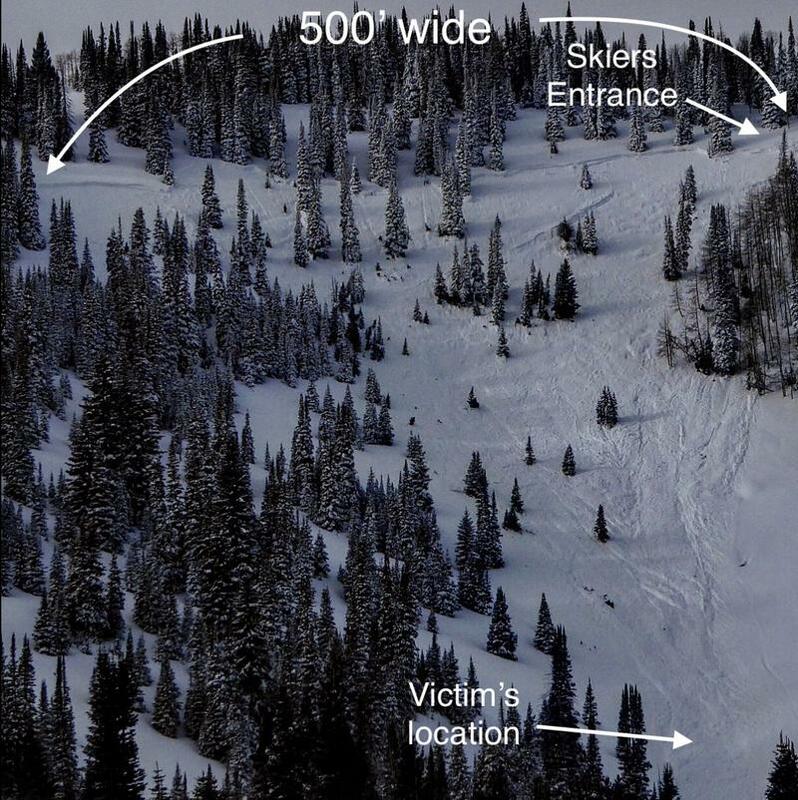 Crown profile recorded where skiers' tracks entered the avalanche. 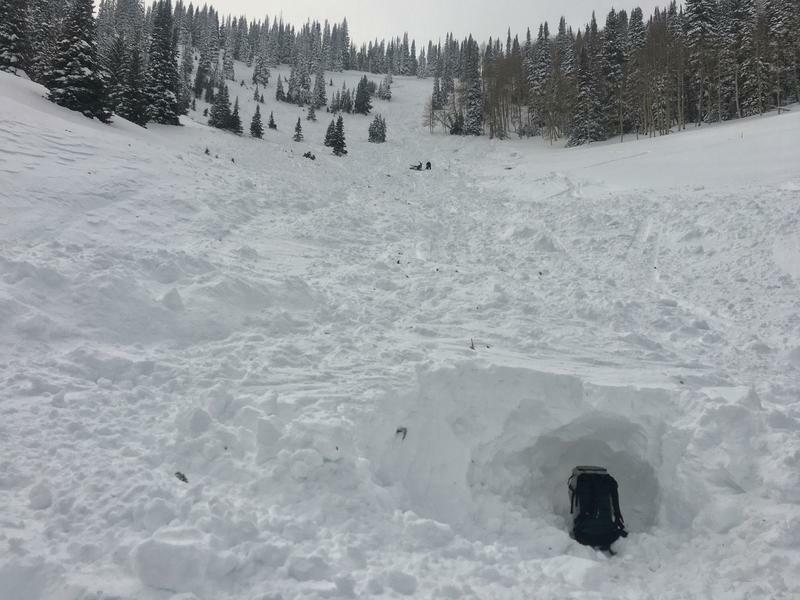 The Skyline Area Mountains avalanche forecast for January 18, 2019 stated: "Conditions are still dangerous but not as bad as if we'd received the forecast amount of snow. The avalanche danger is CONSIDERABLE today. Human triggered avalanches are likely on the upper elevation steep slopes. Any slope with recent deposits of wind drifted snow should be avoided." 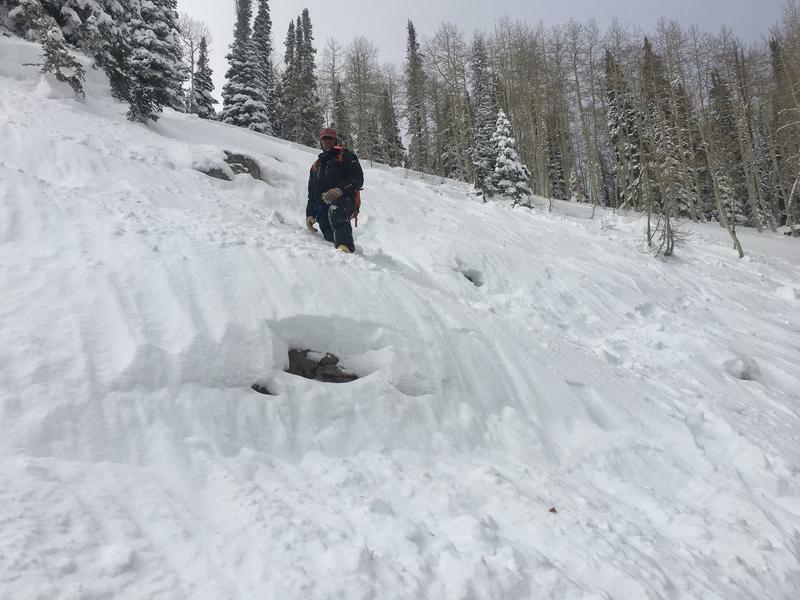 Since January 7th, and before the accident, the Skyline avalanche reports included 12 slab avalanches, averaging 2' deep and 200' wide. Nine of the twelve involved faceted snow layers. 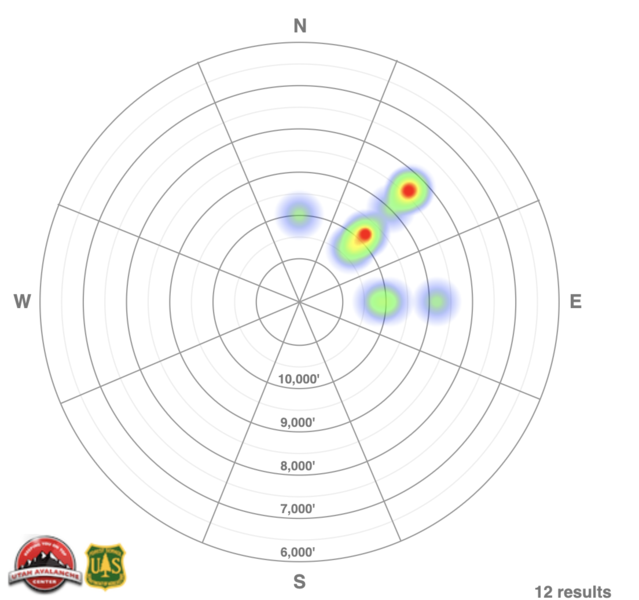 A 'heat map' of the activity is found below, depicting the pattern of the avalanche activity on an aspect/elevation diagram. Overview photo of avalanche and photo from flank of avalanche. Pack is where tracks of the victim enter the avalanche. Photo of burial location approximately 500 vertical feet below the crown. Pack in the photo for scale. We aim to learn from accidents like this and in no way intend to point fingers at victims. 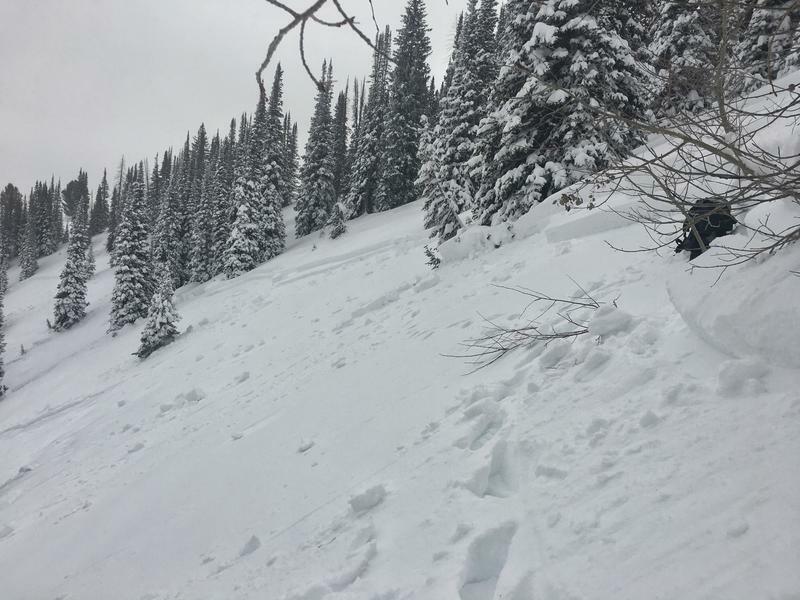 All of us at the Utah Avalanche Center have had our own close calls and know how easy it is to make mistakes. No one is immune to this. This is the third avalanche fatality this winter in the United States where the victim was not wearing an avalanche transceiver. Your chances for surviving an avalanche burial are greatly increased if you wear an avalanche transceiver. It is important to always keep an eye on your partner when they are descending avalanche terrain. This way you are quickly aware of an avalanche if one releases. If you are watching your partner when they are caught in an avalanche you have a better chance of knowing where to start your rescue effort which ultimately saves time. Time is crucial as statistics show - the greatest success of live recoveries happens within about 15 minutes of burial. The part of the slope where these skier descended seemed fairly benign compared to the rest of the slope. It was 31 degrees in steepness where they started their descent. There was a short rollover that reached 37 degrees. Our perceptions of hazard can vary a lot, but the most important terrain factor for avalanches is slope angle. 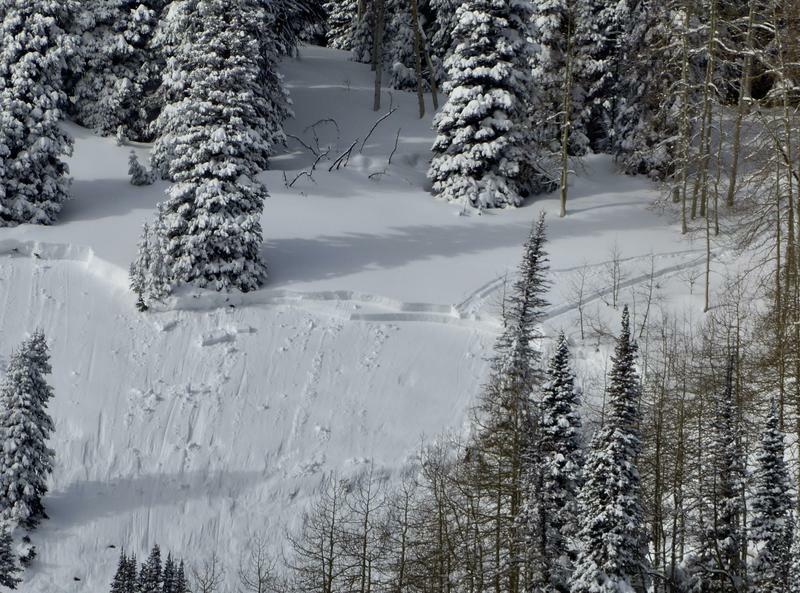 This search and recovery was performed by Emery County Sheriff's Office and SAR, Sanpete County Sheriff's Office and SAR, Utah Department of Public Safety, Utah Division of Natural Resources, Utah Department of Transportation, Alta Ski Patrol, Forest Service LEO's, and the Forest Service Utah Avalanche Center.